Another year passes by and I am back at Kogetsu at The Saujana Hotel Kuala Lumpur for a taste of their new menu items and new quick lunch sets. Kogetsu, which means Reflections of the Moon on Water, has been serving authentic Japanese cuisine to many gourmands set in traditional Japanese ryokan overlooking a lake at hotel. 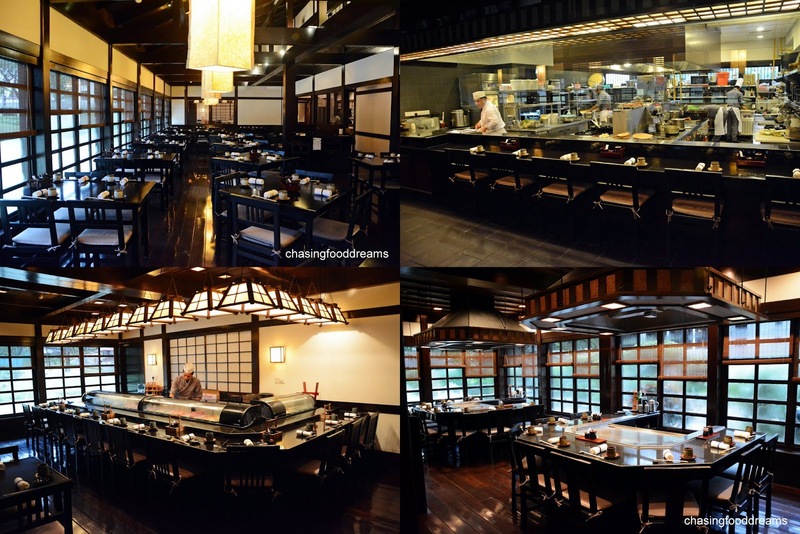 The Japanese restaurant is spacious and offers diners a choice of regular dining room, a separate teppanyaki room, sushi bar or tatami private rooms. The menu is filled with a list of sumptuous authentic Japanese dishes prepared by resident chef Taketoshi Minami and his team. To cater to the many diners’ busy hours during work days, Kogetsu has introduced a choice of 3 quick Lunch Sets that will satisfy the appetites during lunch hours. These lunch set are full meals with choice of meat or seafood that comes with salad, soup and free flow of green tea. Fish lovers will enjoy the Sanma Teriyaki Set (RM53), a healthy dish of grilled pacific saury drizzled with teriyaki sauce. The fish is beautifully grilled with a good smoky note and the flesh is fine and sweet. It’s perfect for lunch as it is light. It also comes with Chawan Mushi and some tsukemono. Tori-Katsu Curry Set (RM50) is a bowl of comfort. Crispy breaded chicken is smothered in Japanese curry sauce with tender potatoes and carrots on rice. I like how the curry sauce is not as sweet as most Japanese curries are. Good choice if you are looking for some comfort food. I would recommend Wa-Don Set (RM48) for big eaters as it has a mini Udon and mini Tanin-don served with salad and tsukemono. Tanin-don is a beef version of Oyako-don. Sliced beef is simmered with onions and egg in a sweet soy broth and is eaten with rice. Besides the quick lunch sets, Chef Minami has also introduce a list of new menu items at Kogetsu. There are new appetizers, main dishes and noodles. We started with a delectable Squid Tentacles in Wasabi (RM38). Nicely chargrilled, the squid tentacles are lightly chewy and smoky. Dip these in wasabi mayo with soy sauce, the tentacles are good stuff. Same goes with Dried Stingray Fin (RM42), the appetizer is quite unusual but is perfect with sake or beer. The fins have an unusual dense and chewy texture. The salty briny flavour is quite addictive and makes great snacks. Japanese Beancurd with Fresh Salad (RM28) is light and healthy. Crisp shredded greens, silken tofu cubes, fresh cut tomatoes and bonito flakes are dressed with a creamy and tangy citrusy dressing. Easy to enjoy some greens. Going more luxe, enjoy the Baked Scallop with Fish Roe (RM32) for its richness. Sweet scallops on shells are baked in creamy and rich fish roe sauce. A squeeze of lemon eased off the richness of the fish roes and enhanced the flavours beautifully. Fried Mackerel with Curry Sauce (RM39) is delicious! No sauce but there is light curry spices on the beautifully grilled fish. It’s moist and firm. The subtle hint of curry spices is rather delicate so don’t expect heavy flavours but enough to give the dish a different flavour note. I enjoyed this a lot. Breaded Salmon Cutlet with Miso Sauce (RM42) is big on flavours. The crispy salmon has generous lashings of the robust nutty and savory miso sauce. On a personal note, I would love to enjoy this with rice because of its heavy flavours. I enjoyed the crispy Asparagus & Silver Fish in Batter (RM42) a lot. It’s simple but the combination worked well in flavours and textures. I wanted to order rice when Eel with Burdock Roots & Egg (RM45) arrived. Eel pieces is simmered in a claypot with burdock roots and egg in a lightly savory and sweet broth. The burdock root still has a good bite, contrasting with the soft eel and egg. It’s quite a rich dish with the creamy and smoky eel. Wheat with Red Snapper in Broth Kyoto Style (RM38) epitomize what Japanese loves, delicate and soothing flavours that showcase the ingredients’ freshness. Delicate shoyu broth with soba noodle and sweet red snapper proved to be a good dish anytime. Same goes with another classic favorite of mine, the Nabeyaki Udon (RM43). Slurping thick lightly chewy udon noodles in a delicious broth with poached eggs, prawn tempura and some other vegetables is soothing and satisfying. Clams in Sake (RM30) had us savoring clams cooked in sake broth. It’s decent as the clams are succulent and tender. My first thought of the Eel Roll & Crispy Salmon Skin Roll (RM43) that it would be too overpowering with the layer of herbs. I was glad it didn’t. The soft eel and crispy salmon skin provided good flavours and textures while the generous coating of herbs added a unique note to the roll. Mushroom Teppanyaki (RM27) is a popular requested dish and I can see why. The assorted mushrooms sautéed a la teppanyaki style in luscious butter and shoyu sauce and topped with lots of fried garlic and spring onions. It was so aromatic and had a burst of sumptuous flavours. The mushrooms really soaked up the buttery goodness and the garlic is just perfect to tie up the flavours. The Beef Teppanyaki (RM75) is a sure crowd pleaser. Glorious cuts of tender and juicy beef cooked in butter and shoyu sauce with dashes of pepper and served with lots of crispy garlic slices is so good, you might not want to share this plate.